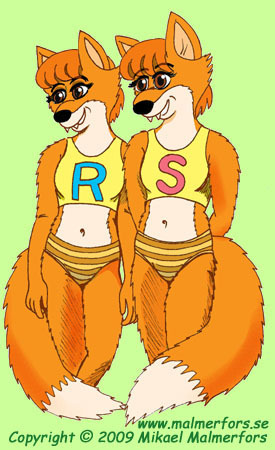 This is the story of two girl foxes (and their brother, before he started a family of his own) and how they grow up dealing with their animal friends and foes, while avoiding contact with the humans. They would have lived calm and quiet lives, had it not been for their wild cousins dragging them into all kinds of adventures. The adventures occasionally takes them to remote locations all over the world, but the action mostly takes place in Räviania (a secret underground country in a forgotten human military installation situated in a remote location close to the border between Sweden and Norway), or nearby their old den, located somewhere by the Swedish west coast where they spend most of their vacations. That was a quite a long sentence, wasn’t it? Read more about us in the cast page! It all began in 1974 when I was 10 years young and my school teacher gave me a fable-writing assignment. She read it in front of the the class, and it made a great success. 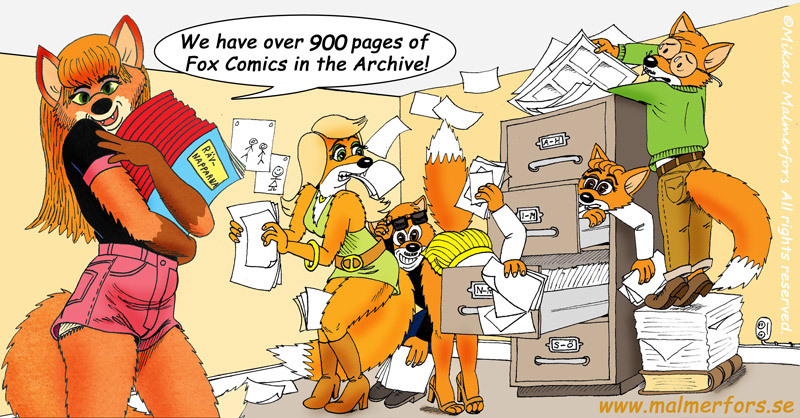 I since managed to squeeze in my foxes in most of my schoolwork that year untill the teacher had enough. I then let them continue their adventures in a comic strip in the School Paper. I have re-drawn the adventures several times as my drawing skills evolved, but I intentionally tried to draw in a style similar to the original. See for your self on the Comic Pages if you don' t belive me!